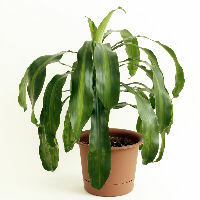 Corn plant (Dracaena fragrans) is a delightful tropical indoor houseplant that originated in Africa. It is an easy-care plant that grows on a single stem with leaves reaching outward. The leaves are broad and dark green with a central, lime-green stripe down the middle. 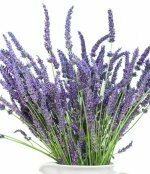 These plants are also grown with 2 to 3 pruned stalks in a single pot. Each stalk is of a different height and produces clumps of foliage. It is a slowing-growing plant that usually grows up to six feet high and three feet wide indoors. It will thrive in low light; however, When given ample light, the corn plant may produce sprays of fragrant white flowers that bloom at night. 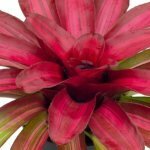 This plant grows straight up which makes it a great choice for decorators to use for filling empty corners. Plus, placing this type of plant in an ornamental cache pot makes it even more attractive. It thrives indoors in low light. You can often find them in hotel lobbies, office buildings and shopping malls. It not only adds visual interest, but it has health benefits. This is a excellent way to green up your home because the dracaena fragrans purifies the air by getting rid of toxins and adding oxygen to the air we breathe. Many of the items that we use every day such as carpeting and rug pads, insulation, laminated counters, veneer furniture, cleaning supplies, and air fresheners contain volatile organic chemicals (VOCs) which are synthetic materials that "off-gas" toxins. These toxins can cause a condition known as "Sick Building Syndrome" which can pollute the air enough to irritate your respiratory tract and cause headaches, sinus congestion, and fatigue. You cannot avoid VOCs because they are found in such a wide variety of the products in our indoor environment; however, you can take steps to make your air healthier by having this plant in your home. Place two or three mature specimen plants in a 100 sq ft room to filter toxins from the air where you spend time. Light: Low to medium (near a bright window). If your plant is going to be in any kind of intense light it, use a curtain to filter the light. Temperature: 60 to 75 degrees Fahrenheit, Avoid cold drafts. Watering: water thoroughly, then allow the soil to drain and empty excess water; then allow the top one inch of soil to dry slightly to touch between waterings. A well-draining potting mixture should be used. This is necessary to prevent root rot which can kill your plant. Humidity: The plant likes moderate humidity, as they are known to get brown leaf tips in dry air. Spray leaves with a fine misting of water or place on humidity tray. A room humidifier will raise the relative humidity levels. Fertilizer: Fertilize during the growing season with a balanced liquid fertilizer during the growing season. Pruning: Cut back if plant becomes too tall, new buds will develop. Repotting: Repot the plant in sterilized potting soil when it completely fills up the pot. Propagation: Tip cuttings can generally be rooted easily. Pests: Check for spider mites on the undersides of leaves; if present spray with with appropriate pesticide. Common Problems: Plant is fluoride sensitive; You can use a rain barrel to catch rainwater or use distilled water. If leaves start to yellow, cutback on watering. Keep your plant leaves clean and you will have one great looking plant! Warning: Plant is toxic to pets. Check with the ASPCA for more details.